Siberian Huskies are an active dog. They require exercise and do need attention from their human owners. Siberians need to be "bossed" by their human owners or they will quickly rule you. They are a Spitz breed so have a double coat and require brushing regularly to maintain this. Siberian Huskies love to live in the house with you as much as outside. They are a people oriented dog BUT they must never be trusted off lead. Good fencing with dig proofing is essential to keep your Siberian in your yard. Siberians can become difficult in their teenage years (around 8 or 9 months). This does settle down again at around 18months of age. Otherwise they are a pleasure to live with. Activities such as sled racing are popular with Siberian owners. This breed can be obedience titled but a firm control must be gained of the dog. They are a popular breed and due to their exuberant nature are just as easily discarded as owners do not realise how difficult they can be. 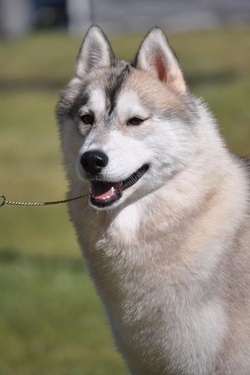 Home of Multi Best in Show, Runner Up to Best In Specialty Show & Multi Runner-Up Best in Show winning Siberian Huskies & Multi Titled Australian Grand Champion Siberian Husky. in 2014 after she has her maternity duties completed. Spirit has been shown sparingly and then against her mum and other Best Exhibit In Group winners. She will come into her own once back into the ring regularly. Trouble was co-breed with Michele Kearney in NSW. She has come back to us as a return pup for her beautiful mum. Trouble is exactly that Trouble by name and Trouble by nature. She is a true siberian husky in every meaning of the breed. 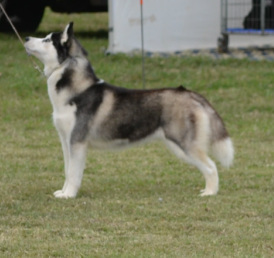 Myah has been an amazing girl to show. Having spent 4 years being a home body we brought her out to complete her grand championship. Along the way she amassed Multiple best exhibit in show wins and best in group wins. Sufficient to gain her Supreme championship. this she did in just over a year of coming back out. 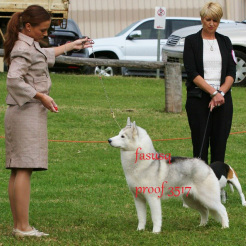 Also in that time she has successfully beaten some of the countries top show girls including Supreme Ch Suthernlites Firesong and Supreme Ch Alyeshka Little Miss Perfect Imp NZ. Both of these girls are beautiful examples of the breed. Myah is desexed and mostly retired. She telss us otherwise though. She loves showing even now and occasionally goes out to the shows entered in Neuter of which she has regularly won Neuter in show.